I have the above-referenced form on my website, www.pearlbluegrass.com. It is is linked about half-way down the main page, in the "News" section which has a yellow background. This form is linked under News item #4, "Display your quilt on the Pearl stage". When I click on "Test Email", the Auto Responder text is sent to my e-mail address, sek@austin.rr.com. 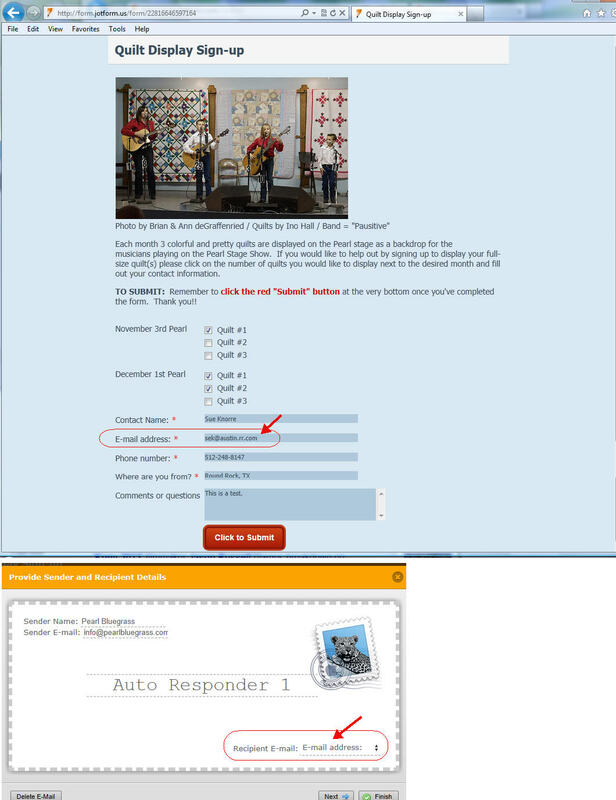 However, when I submit a test form from the www.pearlbluegrass.com website and fill in sek@austin.rr.com address in the form for the E-mail address I do not receive a message from the Auto Responder. Can you please help me figure out why? The top of the screen shot I attached shows the form as I fill it out and the lower part of the screen shot shows how I set up the Auto Responder. We are sorry for a bit delay and have not able to help you with your problem, but we are glad that you have sorted it out. Just please let us know if you need further assistance. We're here to help. For some reason Auto Responder is not working again. I tried deleting the Auto Responder and recreating it several times but this time that does not work. I have looked everything over carefully but cannot see anything I have done wrong. Will you please take a look and let me know what needs to be done to get the Auto Responder working again? I have tested your form just now and I was able to get your form autoresponder. The problem might be due to your spam filter, try reviewing your spam settings or white list the sender email if necessary. Or, the message might ended up to your spam/junk folder you should check them there as well. I do not think it is my spam filter that is causing the problem because I was initially able to receive the Auto Responder messages when I did my testing. * I changed the Subject line from "Auto Responder 1" to "RECEIVED - Dec 1 Stage Show Sign-up"
* There are no Auto Responder messages in my Junk folder. I receive all kinds of other messages to/from info@pearlbluegrass.com daily so I don't think that is the issue. Could you please do further investigation or ask someone else on your team if they can notice what might be wrong? Hi. This is to acknowledge receipt of your sign-up form for the December 1st Pearl Stage Show. After receiving sign-up requests for one week, the online schedule will be posted on Sunday, Nov 11th. Any remaining open slots will continue to be filled after that. I have tested your form, and received the Autoresponder message to my google apps hosted email address. Some email providers have strict email validation rules, I think that Road Runner simply does not accept email messages from your form as the real sender is not 'info@pearlbluegrass.com'. Most of form users will get their email Autoresponders, but there is not much that we can do about the Road Runner email policy.